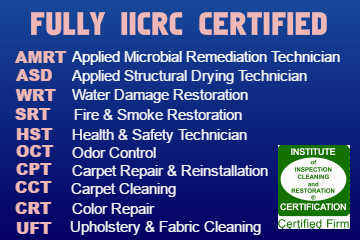 The IICRC (Institute of Inspection, Cleaning & Restoration Certification) sets the industry standards. CRM Services LLC is fully Certified by the IICRC in the wide range of services needed to address any restoraction challenge. Mitigation & Restoration are difficult tasks that require a level of knowledge, skill and experience that should only be entrusted to proven professionals. If disaster strikes your home, business, commercial, industrial or institutional property, call the CRM Services PROS first. Don’t take chances – call the CRM Services PROS 24/7/365 for a Free No-Obligation, No-Hassle Estimate at 678-540-8606… or click on the LIVE CHAT button in the corner of this page for 24/7/365 assistance.